South Australia: Will we survive, or are we doomed to bankruptcy? By Cate Schafing / May 10, 2018 / Accede , Small Business Advice / No Comments on South Australia: Will we survive, or are we doomed to bankruptcy? Will we survive, or are we doomed to bankruptcy? 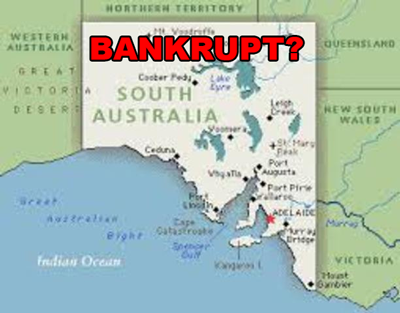 South Australia – Will we survive, or are we doomed to bankruptcy? Finally a new State Government, but are we too late? Is there too much debt? Are there too many issues to fix? Has independent business given up on South Australia? I am sure these are questions that are currently plaguing the new State Government. However, the information contained below is not a political positioning, but a true look at where South Australia is – and asking some honest questions. I am a South Australian Born employer – who has employed South Australians for 35 years. I work in the IT industry, but work with other businesses in many other industries. Like it or Not, South Australia is in a Difficult position, in so many areas, that it is a bit like a leaking sieve. Lets look at some of the problems and then we can in a general sense see what can be done. Currently SA has a huge debt in comparison to the income we are generating. This has been created due to a range of needs. Why has this debt come about? Here are some of the reasons, New Hospitals, Job Creation Schemes, Road Works, Maintenance of a huge infrastructure. Unfair Positioning – Lack of Federal Power. This sounds odd, but consider some facts. If you had a business that relies on freight, why with the same wage costs would you be based in South Australia rather than Melbourne or Sydney – where you have a great pool of resources, larger sales pool and lower freight costs. You would not. In many years past, SA had lower wages, which compensated for its remoteness – trying to lower the infrastructure demands on Melbourne and Sydney – as having them the same, would stress their infrastructure. However, in the demand to be fair – the Fair work act, as actually made the position of South Australia, Queensland and Tasmania – unfair. This has a snowball effect. Less business, less people, less ministers – less power to make change. So we are stuck. Somehow – the Australian Federal Government have to bring back a fairness for business, so we don’t all reside on the Eastern Seaboard. Bad decisions by State Government departments. I experience this every single day in every single way as a business owner. These sub divisions in action are telling me a business owner to not employ South Australians or to take my business and leave South Australia. You may ask what and why. Examples are everywhere. Safe Work SA – bad policies and bad treatment of companies who are doing the right thing – I agree if the company is doing the wrong thing, but you cannot assume a company is guilty before they even start and then penalise them when they are proven to have done the right thing – Yes, this is the Safe Work SA Policy. Lack of foresight by Departments, e.g. smaller roads, less infrastructure etc. Higher local taxes and Rates. Wow, this is an area that has been in the media so much. But let me just give you a few of these. Land Tax, Electricity, Bank Taxes, Water Rates, Emergency Levy’s, this list could keep going. In short, we have much higher taxes, and Rates in comparison to any where else in Australia. OK – enough negative statements. So what can and are we doing to fix this. Well there is good news. Luckily both Past and Current governments have some things heading in the right direction, which I will point. The question is however is this enough and what do we as individuals or people in positions of authority need to do? There are some great grants, initiatives and schemes available. I do not know of all of them as so there is a distinct lack of marketing, and this needs to be fixed. But there are some brilliant options. I would at this point like to praise some groups and individuals such as WorkSkills. they have some lovely people employed who really care, follow up and are doing all they can. Also the marketing and selling of our education is world class – well done IES. We have people and the structure for this to fix a lot of the bad policies, however, it seems that those that have the ability do not always have the passion to act. Ministers and Ombudsman, it is in your charter to review, listen and recommend change. If a policy is bad – recommend – don’t be afraid to do your job. You are the last option for many businesses – you need to be OK about recommending change. We need you to act and be proactive. Some of you really are proactive and out there – for you that are – thank you. For those that aren’t – please step up, we as a state need you to be proactive for us. Do the right thing in all areas. Too many employers are taking things out on Employees – this is not right. Things may be tough, but think outside the square. Do the right thing by those you employ. Treat people as you wish to be treated. Treat other companies as you wish them to treat your company. If you are having a tough time, don’t hide, ask your mentors and staff to help you get through this. Look into some of the grants and schemes available, they can really assist. Don’t be afraid to network with other companies that can give you ideas – try to get a mentor to work with you. I know for fact, how much a coffee with a mentor can mean and assist. You also need to do the right and fair thing, not just for your company, but for your, friends, family and state. Every time you take, e.g. bludge, skimp on work, short cuts, etc. you know what this is, you are actually hurting all of us. So each of us need to do the right thing. Retired or Unable to work or Find Work. Volunteers are the life blood of this state right now. We need you to give what you can. This may be in the form of just chatting with an elderly person, or maybe you can do more. But South Australia needs Volunteers. So please give and support your state in any way you can. VolunteeringSA&NT. Together we can work at fixing the problems South Australia faces, but we all need to work together and all be positive. Let us make SA Great again.